The huge search news yesterday was Bing's Facebook announcement. 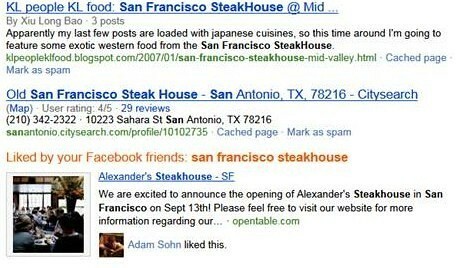 In short, Bing is now showing you search results that your friends on Facebook like. Let me be clear, the Bing organic search results are currently not changing based on your Facebook data. Instead, Bing is adding a module on the search page that shows results that your friends might like for the query. Got that? This alone is valuable. Personally, not to me, since I really don't use Facebook like I should. But so many people, not people who use Twitter (techies) but people like your mom and dad, sister and brother, use Facebook. This is incredibly valuable. Google would not deny this, heck they are trying to make a huge push in social search by using Twitter and other open social networks, but nothing comes close to what Facebook has and they are closed. That being said, currently the organic results on Bing are not impacted by this. Will they be? Who knows, maybe in the future. But if it is, I wonder how that impacts the Yahoo results. Recommended reading for this? Of course, Danny's article at Search Engine Land. Matt McGee notified me of Amit Kumar's post on this. Amit was at Yahoo before Yahoo "killed" SearchMonkey (Amit used those words and he built Search Monkey). He said this will give Bing more relevant results than Google within a year - I guess that is if they have it impact the pure organic results. Forum discussion at Sphinn, WebmasterWorld, DigitalPoint Forums.